A Government of Implied Powers? This article is in response to an article in the Beaufort Observer entitled “What Needs to be Done about Abuse of Power by the Federal Government?” which in turn was based on Calvin H. Johnson’s article “The Constitution or Liberty” in The Freemen. The US Constitution was designed to accomplish two goals: Form a government vigorous enough to conduct the affairs of the nation (overcome the limitations of the Articles of Confederation), yet limited enough so that it did not endanger the rights of its citizens or encroach upon the sovereign powers of the States (other than those expressly delegated to it by them). Stanton Richmond wrote an article that claims that the drafters of the Constitution had no intention of limiting the national government’s powers to the 16 items listed in Article I, Section 8, of the Constitution. He cites the fact that they declined to incorporate a provision from the Articles of Confederation into the new Constitution which read: “Each state retains its sovereignty, freedom, and independence, and every power, jurisdiction, and right, which is not by this Confederation expressly delegated to the United States, in Congress assembled.” He asserts that they did so because they believed the federal government needed implied powers. Richmond is correct when he says that the Constitution needed to provide more power to the government, but the only real difference in the government provided by the Constitution is the power to regulate commerce and an expanded taxing power. In Federalist No. 61, James Madison wrote: “What are to be the objects of federal legislation? 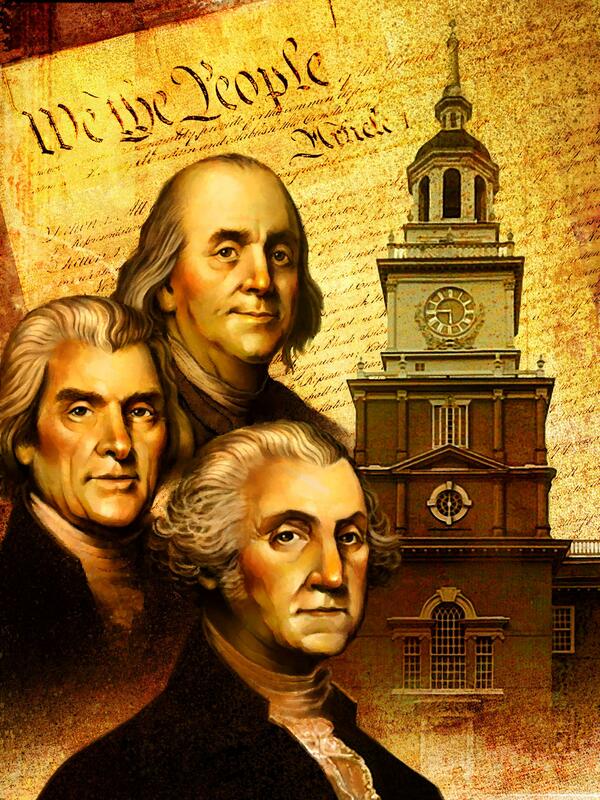 Those which are of most importance are commerce, taxation, and the militia.” Recall that we nearly lost the Revolutionary War because the provisional government could not enforce taxation from the states. It could only “ask” them to send funding for the war, and many states did not answer that request. The opening phrase to Article I reads: “The Congress shall have Power To lay and collect Taxes, Duties, Imposts and Excises, to pay the Debts and provide for the common Defense and general Welfare of the United States; but all Duties, Imposts and Excises shall be uniform throughout the United States.” Our framers did not intend this as an independent, limitless grant of power. It was included to ‘qualify’ the powers set forth in Section 8. It was not, as Mr. Richmond, indicative of a government that was intended to have both express and expansive implied powers. I will explain this more fully below, and through examples. “This (taxing) power, exercised without limitation, will introduce itself into every corner of the city, and country-it will wait upon the ladies at their toilet, and will not leave them in any of their domestic concerns; it will accompany them to the ball, the play, and assembly; it will go with them when they visit, and will, on all occasions, sit beside them in their carriages, nor will it desert them even at church; it will enter the house of every gentleman, watch over his cellar, wait upon his cook in the kitchen, follow the servants into the parlor, preside over the table, and note down all he eats or drinks; it will attend him to his bedchamber, and watch him while he sleeps; it will take cognizance of the professional man in his office, or his study; it will watch the merchant in the counting-house, or in his store; it will follow the mechanic to his shop, and in his work, and will haunt him in his family, and in his bed; it will be a constant companion of the industrious farmer in all his labor, it will be with him in the house, and in the field, observe the toil of his hands, and the sweat of his brow; it will penetrate into the most obscure cottage; and finally, it will light upon the head of every person in the United States. To all these different classes of people, and in all these circumstances, in which it will attend them, the language in which it will address them, will be GIVE! GIVE! A power that has such latitude, which reaches every person in the community in every conceivable circumstance, and lays hold of every species of property they possess, and which has no bounds set to it, but the discretion of those who exercise it – I say, such a power must necessarily, from its very nature, swallow up all the power of the state governments. I shall add but one other observation on this head, which is this: It appears to me a solecism, for two men, or bodies of men, to have unlimited power respecting the same object. It contradicts the … maxim, which saith, “no man can serve two masters,” the one power or the other must prevail, or else they will destroy each other, and neither of them effect their purpose. It may be compared to two mechanic powers, acting upon the same body in opposite directions, the consequence would be, if the powers were equal, the body would remain in a state of rest, or if the force of the one was superior to that of the other, the stronger would prevail, and overcome the resistance of the weaker. But it is said, by some of the advocates of this system, that “the idea that Congress can levy taxes at pleasure is false, and the suggestion wholly unsupported. The preamble to the Constitution is declaratory of the purposes of the [our] union, and the assumption of any power not necessary to establish justice, etc., provide for the common defense, etc., will be unconstitutional. Neither the general government nor the state governments ought to be vested with all the powers proper to be exercised for promoting the ends of government. The powers are divided between them-certain ends are to be attained by the one, and certain ends by the other; and these, taken together, include all the ends of good government. This being the case, the conclusion follows, that each should be furnished with the means, to attain the ends, to which they are designed. To apply this reasoning to the case of revenue, the general government is charged with the care of providing for the payment of the debts of the United States, supporting the general government, and providing for the defense of the union. To obtain these ends, they should be furnished with means. But does it thence follow, that they should command all the revenues of the United States? Most certainly it does not. For if so, it will follow, that no means will be left to attain other ends, as necessary to the happiness of the country, as those committed to their care. The individual states have debts to discharge; their legislatures and executives are to be supported, and provision is to be made for the administration of justice in the respective states. For these objects the general government has no authority to provide; nor is it proper it should. It is clear then, that the states should have the command of such revenues, as to answer the ends they have to obtain. To say, that ‘the circumstances that endanger the safety of nations are infinite,’ and from hence to infer, that all the sources of revenue in the states should be yielded to the general government, is not conclusive reasoning: for the Congress are authorized only to control in general concerns, and not regulate local and internal ones… The peace and happiness of a community is as intimately connected with the prudent direction of their domestic affairs, and the due administration of justice among themselves, as with a competent provision for their defense against foreign invaders, and indeed more so. The Federalist Papers were the answers to the criticisms and distrusts of the Constitution by the States articulated in the series of Anti-Federalist Papers. The Federalist Papers were written by Alexander Hamilton and John Jay (both of NY) and by James Madison (of VA). It was no insignificant coincidence that these men wrote them. At the time, the two largest and most powerful states, New York and Virginia, were not supportive of the Constitution and it was feared that if these states did not ratify, the hope for a contiguous Union would be frustrated. And so these men wrote the series of papers to explain the meaning and intent of the Constitution, to offer assurances, and to dispel fears (particularly that the proposed government would take too much power from the States), with the ultimate hope that it would convince the delegates of NY and VA to ultimately ratify (which they eventually did in 1788). “Although I am of opinion that there would be no real danger of the consequences which seem to be apprehended to the State governments from a power in the Union to control them in the levies of money, because I am persuaded that the sense of the people, the extreme hazard of provoking the resentments of the State governments, and a conviction of the utility and necessity of local administrations for local purposes, would be a complete barrier against the oppressive use of such a power; yet I am willing here to allow, in its full extent, the justness of the reasoning which requires that the individual States should possess an independent and uncontrollable authority to raise their own revenues for the supply of their own wants. And making this concession, I affirm that (with the sole exception of duties on imports and exports) they would, under the plan of the convention, retain that authority in the most absolute and unqualified sense; and that an attempt on the part of the national government to abridge them in the exercise of it, would be a violent assumption of power, unwarranted by any article or clause of its Constitution. An entire consolidation of the States into one complete national sovereignty would imply an entire subordination of the parts; and whatever powers might remain in them, would be altogether dependent on the general will. But as the plan of the convention aims only at a partial union or consolidation, the State governments would clearly retain all the rights of sovereignty which they before had, and which were not, by that act, EXCLUSIVELY delegated to the United States. This exclusive delegation, or rather this alienation, of State sovereignty, would only exist in three cases: where the Constitution in express terms granted an exclusive authority to the Union; where it granted in one instance an authority to the Union, and in another prohibited the States from exercising the like authority; and where it granted an authority to the Union, to which a similar authority in the States would be absolutely and totally CONTRADICTORY and REPUGNANT. It should be noted that contracts often include a provision which grants authority to do those things that are necessary and proper to fulfill the obligations under the agreement. The way I read the Constitution, in light of what is explained by Hamilton in Federalist No. 31, 32, and 33, and in light of what is written in the totality by the remainder of the Federalist Papers, is this: There is some authority vested in the federal government to define the scope of its powers, but only to the extent that any laws made to govern in such areas must be both “necessary” and “proper.” The word necessary means “needful, indispensable, required..” Since there is an clear effort on the part of our drafters and authors of the Federalist Papers to assure the States that their sovereign rights would remain intact (minus those powers delegated to the federal government) and their status would not be compromised because of the creation of a federal government, it is more than reasonable to assume that the scope of federal power would be limited to the division established in the Tenth Amendment. Thus, all grants of authority to the federal government are limited by what is absolutely necessary and proper and by reserved state rights. Since the Federalist Papers were written as assurances to the States, they were justified in relying on them when they ratified the Constitution. This is just one example of an implied power or an elastic power. [See later for a brief overview of the case interpreting the “Necessary and Proper” clause – McCulloch v. Maryland (1819)]. The bottom line is that unless the federal government is given authority to legislate in a particular area or to use executive powers in certain situations, the government is prohibited and the States retain the powers (under the Tenth Amendment). But the real test of intent is what the States themselves explained in their ratification conventions, because their ratification was premised on THEIR UNDERSTANDING of its terms and intent, and what assurances were given them. The states were the “signing parties” to the Constitution which then established the federal government. The significance of the states in the process is just like a buyer signing a contract with a seller for the purchase of an expensive house. The parties ultimately sign that contract only after thorough discussion and explanation of the conditions and provisions because they know their signature will bind them to the obligations and responsibilities (and the benefits). The contract cannot take on new meaning in the future without relieving the signing parties of their obligations. A contract that is altered allows the parties to walk away. It would be ridiculous to think the states would have assented agreement to a government with enough powers to swallow them up and destroy them. “Liberty, the greatest of all earthly blessing — give us that precious jewel, and you may take everything else! But I am fearful I have lived long enough to become an old-fashioned fellow. Perhaps an invincible attachment to the dearest rights of man may, in these refined, enlightened days, be deemed old-fashioned; if so, I am contented to be so. I say, the time has been when every pulse of my heart beat for American liberty, and which, I believe, had a counterpart in the breast of every true American; but suspicions have gone forth — suspicions of my integrity — publicly reported that my professions are not real. Twenty-three years ago was I supposed a traitor to my country? I was then said to be the bane of sedition, because I supported the rights of my country. I may be thought suspicious when I say our privileges and rights are in danger. But, sir, a number of the people of this country are weak enough to think these things are too true. I am happy to find that the gentleman on the other side declares they are groundless. But, sir, suspicion is a virtue as long as its object is the preservation of the public good, and as long as it stays within proper bounds: should it fall on me, I am contented: conscious rectitude is a powerful consolation. I trust there are many who think my professions for the public good to be real. Let your suspicion look to both sides. There are many on the other side, who possibly may have been persuaded to the necessity of these measures, which I conceive to be dangerous to your liberty. Guard with jealous attention the public liberty. Suspect everyone who approaches that jewel. Unfortunately, nothing will preserve it but downright force. Whenever you give up that force, you are inevitably ruined. I am answered by gentlemen that, though I might speak of terrors, yet the fact was, that we were surrounded by none of the dangers I apprehended. I conceive this new government to be one of those dangers: it has produced those horrors which distress many of our best citizens. We are come hither to preserve the poor commonwealth of Virginia, if it can be possibly done: something must be done to preserve your liberty and mine. The Confederation, this same despised government, merits, in my opinion, the highest encomium: it carried us through a long and dangerous war; it rendered us victorious in that bloody conflict with a powerful nation; it has secured us a territory greater than any European monarch possesses: and shall a government which has been thus strong and vigorous, be accused of imbecility, and abandoned for want of energy? Consider what you are about to do before you part with the government. Take longer time in reckoning things; revolutions like this have happened in almost every country in Europe; similar examples are to be found in ancient Greece and ancient Rome — instances of the people losing their liberty by their own carelessness and the ambition of a few. We are cautioned by the honorable gentleman, who presides, against faction and turbulence. I acknowledge that licentiousness is dangerous, and that it ought to be provided against: I acknowledge, also, the new form of government may effectually prevent it: yet there is another thing it will as effectually do — it will oppress and ruin the people. This new plan will bring us an acquisition of strength — an army, and the militia of the states. This is an idea extremely ridiculous: gentlemen cannot be earnest. This acquisition will trample on our fallen liberty. Let my beloved Americans guard against that fatal lethargy that has pervaded the universe. Have we the means of resisting disciplined armies, when our only defence, the militia, is put into the hands of Congress? He feared the spirit of the American Revolution, and all that our founders hoped to accomplish by its independence from Britain, would be extinguished by accepting it. He urged that provisions be added to protect the fundamental rights of freemen, such as the right of habeas corpus and a trial by jury, and the sovereign rights of the States. In fact, he even urged that Virginia join with other states and form a separate nation should further restraints not be given in the Constitution. Henry’s hostility to the Constitution served a beneficial purpose. It was necessary to put the new instrument through fire in order to test it and eventually to define it. Henry certainly put it through fire. Not only that, but he was one of our leading Founders who forced the adoption of the first ten amendments. In effect, he should be included as one of the great makers of the Constitution. North Carolina also had reservations about the Constitution as originally drafted. The first NC Convention was held in July 1788 in Hillsborough and the delegates declined to adopt the Constitution unless a Bill of Rights was added to further limit the reach of government. William Lenoir refused to support is adoption because he felt that the Constitution needed to be amended to specifically protect the sovereign rights of the States from any attempt by the government to overstep constitutional bounds and enlarge its powers. After assurances were given that a Bill of Rights would be added, NC finally ratified in December of that year. Obviously, the size and scope of the federal government was foremost on their minds. The States weren’t ready to sacrifice their powers or the liberty of its people. It is therefore important to realize the mindset of the States, the questions and concerns that entered their state debates, their reservations in roundly approving the Constitution, and the limitations applied as a function of their clarifying statements in the Conventions. These are much more pertinent to the interpretation of federal powers than any Supreme Court decision. After all, the Court itself is a branch of the government, created under the Constitution and empowered under its own judicial decisions rather than by the Constitution or constrained by the explanations given in the Federalist Papers. The question is “What can be done when the federal government oversteps its constitutional bounds?” In the past, the Supreme Court has responded by enlarging government powers. They’ve done this by applying a liberal or progressive reading to the Constitution that by all accounts was intended to be interpreted strictly. Thomas Jefferson said: ” “On every question of construction let us carry ourselves back to the time when the Constitution was adopted, recollect the spirit manifested in the debates, and instead of trying what meaning can be squeezed out of the text or invented against it, conform to the probable one which was passed.” Madison and others have given similar warnings. According to Jefferson (who sided with Maryland) the establishment of a national bank was illegal under the Constitution. His argument before Congress was this: “The second general phrase is, ‘to make all laws necessary and proper for carrying into execution the enumerated powers.’ But they can all be carried into execution without a bank. A bank therefore is not necessary, and consequently not authorized by this phrase. It has been urged that a bank will give great facility or convenience in the collection of taxes. This might be true. Yet the Constitution allows only the means which are ‘necessary,’ not those which are merely ‘convenient’ for effecting the enumerated powers.” Jefferson further explained that the power to establish a national bank was addressed by the states in their ratification conventions and specifically rejected. According to the states, if the Constitution had indeed granted such a power, that would be cause enough to reject the document. Alexander Hamilton’s response to Jefferson’s interpretation went something like this: “Well that depends on what the meaning of ‘necessary’ is.” [Remember when Bill Clinton pulled that stunt]. Using tortured logic, Hamilton explained that “necessary” often means no more than “incidental, useful, or conductive to.” He argued that the government had implied powers, such as the power to establish a national bank. And so, establishing an early precedent for a disgraceful track record, the Supreme Court rejected the logic of Jefferson and the intent of the States in ratifying the Constitution and interpreted “necessary” to be “convenient.” Convenient for who? The federal government, of course. With respect to the critical division of power between the States and the government, one can easily see how “fair” the high court has been to the States and how vigorous it has been in respecting the powers that belong to them. In modern times, the Supreme Court has declared a federal law unconstitutional for violating the Tenth Amendment on only 3-4 occasions. At least that’s all I can recall at the moment. In 1992, there was New York v. US, where the Court overturned a federal law that forced states to dispose of radioactive waste as it directed. In 1997, there was Printz v. US, where the Courtoverturned parts of the Brady Handgun Violence Prevention Act. And this year, with the healthcare decision, the Court announced that the Medicaid expansion provision amounted to federal coercion of the States. Nullification is premised on the legal, government, and constitutional principle that any law passed without a proper grant of authority is null and void, and unenforceable. Nullification is the inherent right and duty of every State to declare when the federal government (their creation) has exceeded the bounds of authority delegated to it under the Constitution and then to refuse to allow that law to be enforced within its borders. The states have the power under the compact nature of the Constitution’s ratification. The States, as signing parties to the Constitution, are the proper parties to determine the extent of the powers delegated to the federal government and to decide when abuses have been committed. In ratifying the Constitution thru state ratifying conventions (to be distinct from state legislatures; ratifying conventions are more representative of the people), the States were agreeing to be bound to the conditions and obligations imposed by the document for the purpose of uniting together for common purposes and goals. It is just like the example I gave earlier of the Buyer and Seller who enter into a contract for a home. It is only the Buyer and Seller who have the clearest understanding of the meaning of that contract. If the Buyer agreed to pay $450,000.00 for the home and the Seller agreed to sell it for that price, then no party can later claim that the purchase/sale price was anything other than $450,000. In conclusion, I am compelled to expound on the position that the federal government has implied powers. When the government takes that position, it is dangerous and leads, almost without exception, to an insidious enlargement of government powers. And that’s why I wanted to clarify that the government itself should never be the allowed to have sole power to interpret the extent of its powers. It is the responsibility of the States (thru elections and nullification) to stand guard and remind the government, from time to time, that its powers are limited under the Constitution. People who are willing to sacrifice their liberty by succumbing to the mindset that government is free to unilaterally enlarge its powers and that the Supreme Court should be the final tribunal as to the meaning and intent of the Constitution are ready for a master and deserve one. Shame on professors and constitutional groups who espouse this vision of our nation’s government system. They’ve betrayed the ideals of our American Revolution and are willing to substitute one tyrant for another. Our government is quickly becoming our master and we have become its legislatively-controlled slaves. By the way, I encourage everyone to read: Professor M. Stanton Evan’s article – “The States and The Constitution” of July 7, 2010, in First Principles. 3 Responses to A Government of Implied Powers? Pingback: Posts From The “Ignorant Hillbilly-half” | What Would The Founders Think?